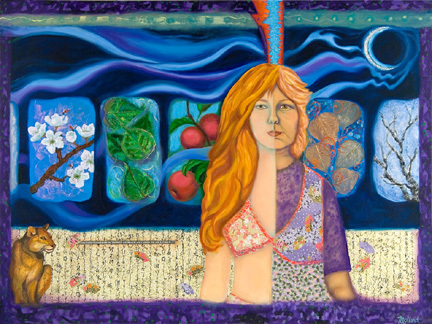 I created this “Self Portrait in Time, 1968-2008” for a competition show at the Smithsonian Portrait Gallery. My main totem animal is the mountain lion. The red & blue lightening bolt above my head divides me into my younger self on the left and my mature self on the right. The background panels of apple trees in different seasons and the moon indicate the passing of time. I included a ribbon I found in a museum that says “To find pleasure in things as much as I did as a child.” A good motto to live by.